This image depicts a pre-Hispanic king from central Mexico, Nezahualcoyotl. He appears in profile, as if running into battle. In one hand he carries a macana, a weapon studded with obsidian blades, in the other, a brightly colored shield trimmed with feathers; the gold arm and leg bands are signs of his high status. The text in the upper left corner identifies the figure by both name and title. He was Rey de Texcoco, (King of Texcoco), an important city-state in the Aztec empire. Nezahualcoyotl came to power in the 15th century (d. 1472), and so this portrait was painted long after his death. He was the father of Nezahualpilli (who is also shown in the Codex Ixtlilxochitl, and in Vistas). As ruler of Texcoco, Nezahualcoyotl was thought to have been a great intellectual and military leader. He is credited with building a large and famous library of pre-Hispanic books—few, if any of which survived the Spanish conquest. This portrait shows him in warrior guise: his outfit worn is made of feathers from tropical birds, which would have been imported into Central Mexico from Guatemala and the jungles of Central America. 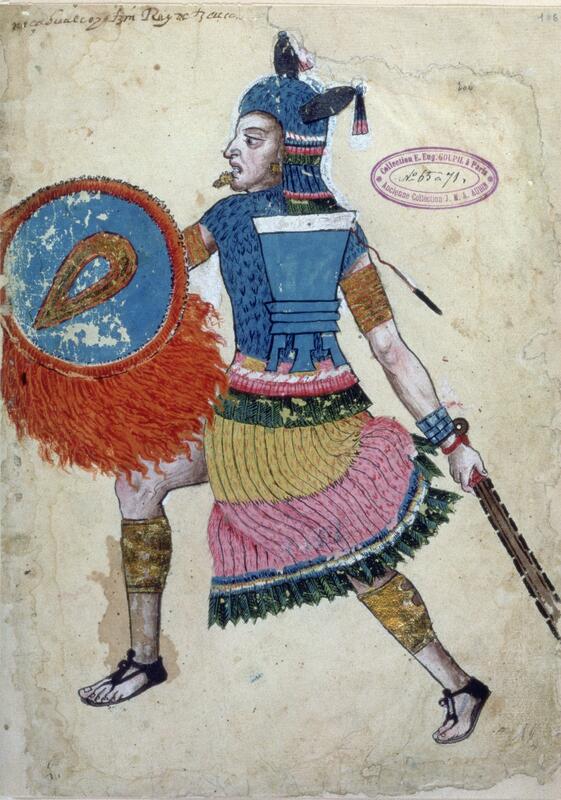 Such feather-covered suits were highly prized in the Aztec empire and reserved for only the most elite of warriors. His shield resembles Aztec examples collected by Spanish conquistadors and priests in the early 16th century, and sent back to Europe. An example of just such a shield also appears in Vistas. This image has many corrections, including the use of white paint to cover earlier sketch lines and painting, as seen at the outer edge of ruler's headdress. The painter shows an awareness of European graphic conventions, seen in the musculature of the arms and legs, the rendering of each finger and toe, and the shading around Nezahualcoyotl’s face. The painter of this image worked first by sketching the image on European paper, then inking in the outlines and lastly, hand-coloring. It is not known if he worked from other pictorial images or written descriptions, but it is likely he used both image and text as models. The manuscript page measures 31 x 21 cm (ca. 12 x 8.5 inches). Created in Mexico as a historical chronicle, the paintings of the Codex Ixtlilxochitl were later owned by a series of collectors now famous for their interest in 16th-century Mexican manuscripts: Carlos Sigüenza y Góngora (17th century, Mexico), Lorenzo Boturini (18th century, Mexico and Europe), and J.M.A. Aubin (19th century, Europe). Today the Codex is in the Bibliothèque Nationale in Paris. Images such as this one are complex because they preserve pre-Hispanic histories, but their perspective has been profoundly shaped by post-conquest events and ideas. Because so many ancient American codices and books were burned by Spaniards or have otherwise been lost, manuscript paintings like this one are now crucial guides to modern reconstructions of both pre-Hispanic traditions and early colonial engagements with that past. Brian, Amber. 2016. Alva Ixtlilxochitl's Native Archive and the Circulation of Knowledge in Colonial Mexico. Nashville: Vanderbilt University Press. Brokaw, Galen and Jonsoo Lee, eds. 206. Fernando de Alva Ixtlilxochitl and his Legacy. Tucson: University of Arizona Press. Durand Forest, J. de, ed. 1976. 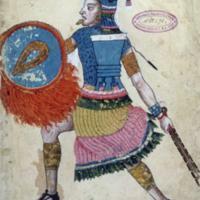 Codex Ixtlilxochitl. Bibliothèque Nationale Paris. Graz: Akademische Druck und Verlagsanstalt. Mexico: Splendors of Thirty Centuries. 1990. New York: Metropolitan Museum of Art.